Multi-axis Vibration Combined Environmental Test System - DAINAN TECH (S) PTE. LTD. 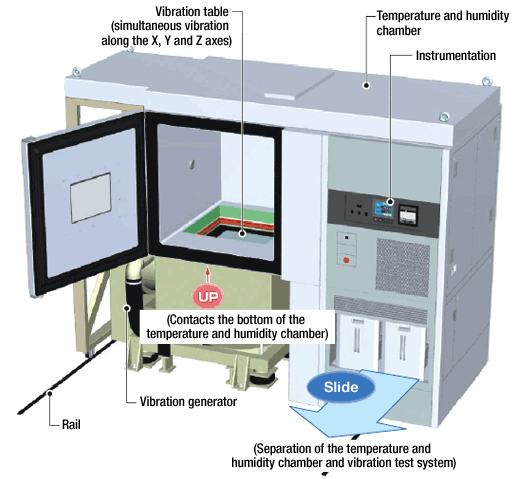 The Multi-axis Vibration Combined Environmental Test System is a environmental test system that combines a temperature and humidity chamber and multi-axis vibration test system. This model uses a multi-axis vibration test system, which enables simultaneous vibration along the X, Y and Z axes in the vibration equipment, thereby eliminating the need to change samples when changing the vibration axis (X, Y and Z axes) and reproducing a vibration environment similar to that in which the sample is actually used. With these advantages, this chamber is the ideal test system for performing combined environmental tests on automotive parts and car electronics products and parts. With a vibration device in which vertical (Z axis) and horizontal (X/Y axes) vibration are performed using separate tables, changing from a vertical vibration test to a horizontal test requires switching the power transmission from the vibration generator from the Z axis to the X and Y axes, and the sample must be moved from the vertical table to the horizontal table at the same time. This chamber, however, can perform both vertical and horizontal vibration on one table, thereby preventing a waste of time due to stopping of the test. Testing can also be automated for more efficient work. To evaluate whether automotive parts functions properly, the parts must be subjected simultaneously to environmental factors, such as temperature, humidity and vibration, similar to the actual field condition, and mutually-induced flaws must also be checked. * The model is for operational purposes and may be changed after order. Thank you for your understanding.